Karina's Kreations: Birthday Blooms Faux Freehand Watercolor Technique! Birthday Blooms Faux Freehand Watercolor Technique! We made this pretty card at my technique class yesterday and I thought I would make a video showing you how to do this. This technique is called Faux Freehand Watercolor. 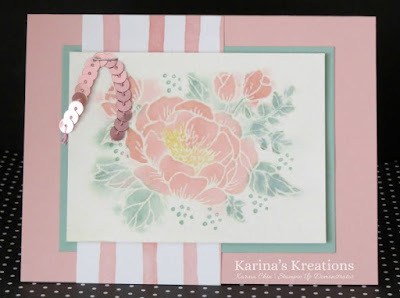 I used the Birthday Blooms stamp set but any of our other line art images such as Blended Bloom, You've got this and Remarkable You would work for this technique.